KEEPS BABY PROTECTED, WARM & COZY: The Polar Fleece warm outer shell baby car seat cover is weather-resistant and insulates your child from wind, snow, ice and rain. Can be used from birth through to toddler. This is our top of the range premium warmth Infant Carrier Cover. 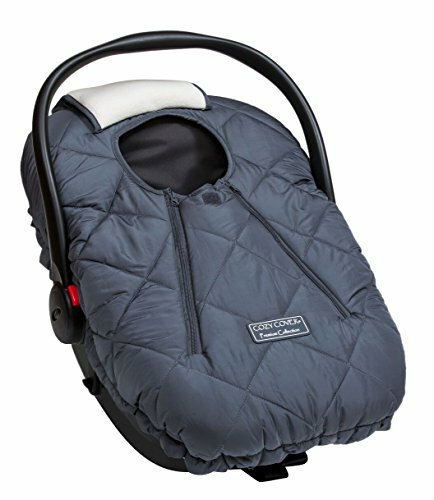 FITS ALL STANDARD BABY CARRIERS: The unique 'Shower Cap' style elasticized edge design makes fitting your Cozy Cover a breeze. You just gently stretch and pull to place it on in seconds. The great thing is it doesn't interfere with child safety straps, so putting it in the car is a breeze also. SAVES MOM TIME & HASSLE: Are you a busy Mom? Do you want to be able to move quickly, snugly and securely with your baby between the house, the car and everything you need to get done in your day? The Cozy Cover keeps your baby warm and cozy as you are out & about without dressing your little one in multiple layers of time consuming bulky winter clothing or a snow suit. It's also machine washable. Many Moms get more than one so there is one Cozy Cover on the baby and one in the wash.
QUICK EASY ACCESS TO BABY: Our unique dual zipper design allows for easy access to getting your baby in and out of the infant carrier. The breathable pull over flap shield baby's face for additional coverage when needed in unfavorable weather conditions.